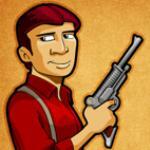 I've always been a big fan of Firefly, since the day it aired in fact. As a graphic designer I've created my share of fan made projects and I love the continuing creation of materials that have been created by amateurs and professionals alike. I think of it as the Expanding Verse and I recently began making all sorts of graphics and designs for several fan made projects, including a short film out of Salt Lake called Reaverized and a webseries by Mediablender out of the Northwest called Courage. I just thought I'd share some of the designs I've posted at fireflyprops.net and the Replica Prop Forum. Enjoy. 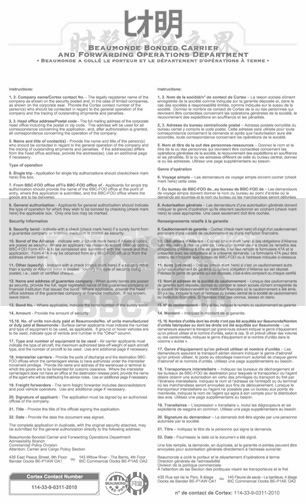 This first document is a standard form for the Declaration of Dangerous goods. 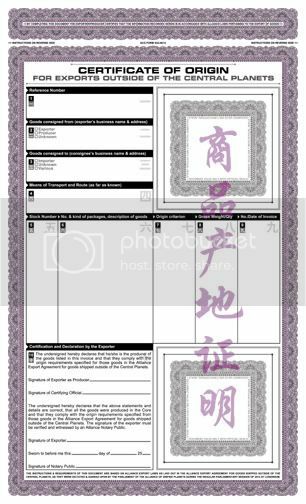 The form is stamped showing an origin out of the Eavesdown Docks, but I left the signature spaces intentionally blank, so that each one can be signed by you with the intention of making them unique. I went for a bold look, with simple write-in spaces and an obvious warning color scheme. 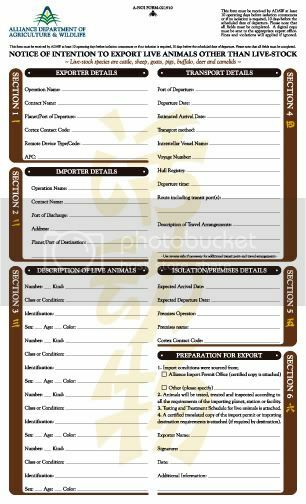 This is based on an actual export form, and I was surprised to see that a form of this kind was so simple in terms of information requirements. It is 8.5" x 14" to match the standard ship's papers size. Enjoy. 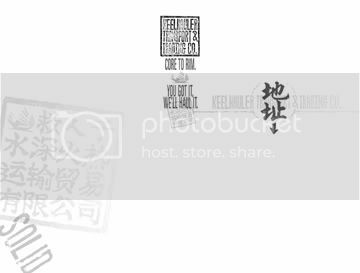 These are Import/Export tags that I created for my Chinese Cooler project, and I've created six different tags for each. Now the tags have random number sets to show visits through the New Kong Customs House at different times. 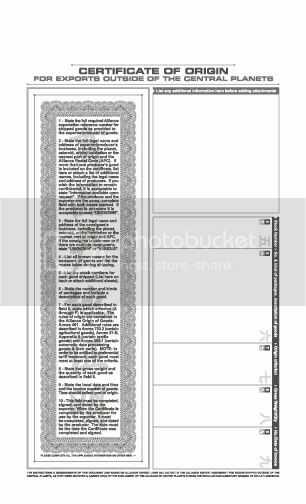 The pdfs were created on 8.5" x 11" with crop marks. 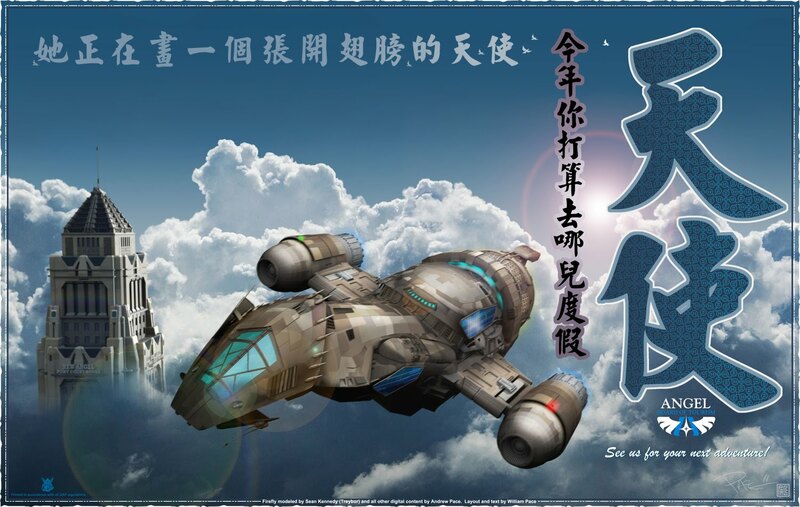 Keelhauler Transport and Trading Company might seem like a fly by night business at first glance, especially to the larger companies and the handful of mega-corporations in the Verse, but not so. Not only does Keelhauler thrive with its handful of old transports and seemingly remote offices, but it manages to pick up so much business that falls through the economic cracks of the Core that it excels on several fronts. First, the Keelhauler fleet is small, so maintenance is small. Rather than maintain a large fleet of ships and shuttles in endless need of repair or replacement, Keelauler piggybacks more than 85% of its transport and trade with other cargo ships, ingoing and outgoing passenger liners and smugglers already bound for destinations favorable to shipping and receiving. Second, Keelhauler has little to no overhead. Small runs in great quantities means big business with little storage or stock issues. Also, the name is hard to forget. Even if one could forget such a name (with that special 'I'm sorry...what?' quality) Keelhauler itself would never let you forget it. What Keelhauler lacks in large advertising funds, it more than makes up for in the liberal distribution of cheap print goods. 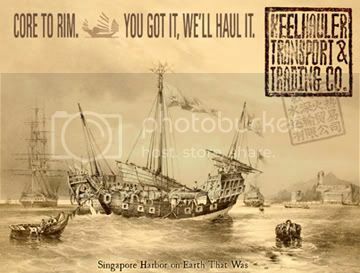 Ship a box or two for Keelhauler and expect to walk away with a t-shirt or two and a handful of classic postcards (perfect for that handwritten wave from the Rim). "Dear Ma. Our postman got ate by Reavers, but the youngin's are just fine." 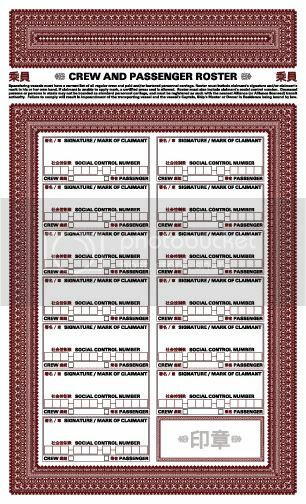 NOTE: These are set up as U.S. standard sized postcards for mailing. You should print these on pretty heavy cardstock, or they'll fail as actual postcards. My special thanks to my wife, who typed all the French for this document, 'cause this thing is text intensive. Also a big thanks and a nod to the indomitable Whitefall for passing along some last minute information from the Atlas of the Verse, so that I could finish the instructions side of this form (specifically the names of port cities for the addresses, i.e. Bander Docks & BIC Commercial Docks). 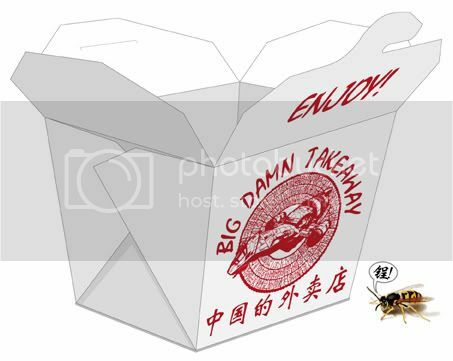 My Big Damn Takeaway box. I made this for our Can't Stop the Serenity screening back in October of last year. 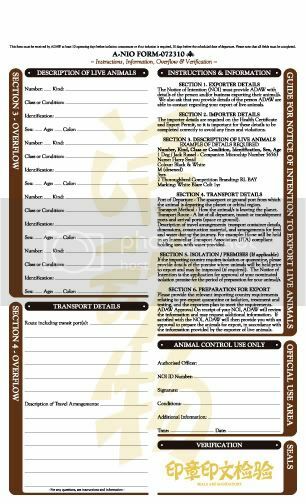 This ship's paper is based on a Certificate of Origin for goods being shipped from the Central Planets. I didn't stamp or sign this one, as it's meant to be generic for any of the Central Planets. I kept the color scheme Alliance-esque with grey, black and purple. Print at 100% on 8.5" x 14". 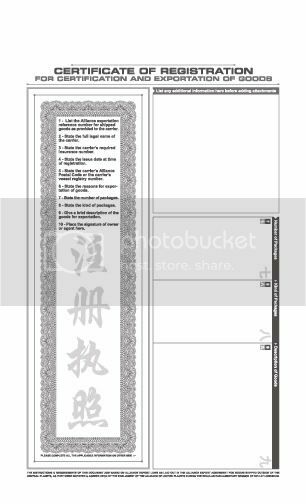 This a companion piece to the Certificate of Origin, called a Certificate of Registration. It's marks the difference between a carrier of exported goods and the actual producer/exporter of goods. Just a little more Alliance red tape. Interesting... 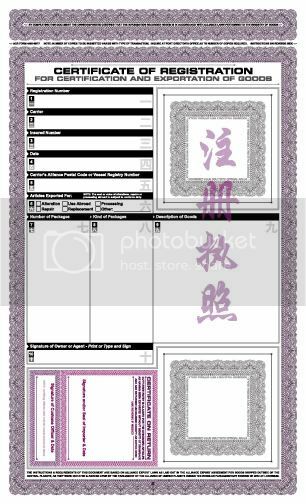 I like the "dangerous goods" form, though I wonder if a world isn't so backbirth that they actually HAVE Alliance customs officials just how often they use paper. 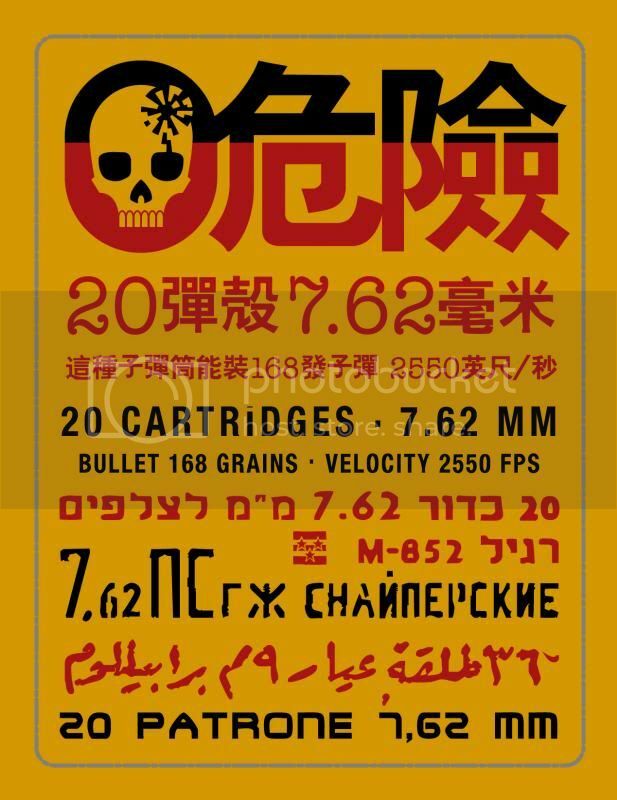 But I bet you could put a typing fade in animation for some of the Chinese and text in Flash or something, make it look all high-tech and digital, maybe edit it into a video production on top of a regular piece of paper. Thank you. There's going to be a lot more where those came from. Food and beverage labels, munitions, technical manuals, etc. 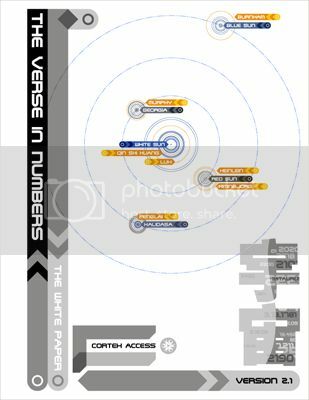 Shortly after the Official Map of the Verse came out, J. Chris Bourdier created the Verse in Numbers, and shortly after that I threw the ARC (Astrogation Reference Charts) together. I recently discovered a few subtle mistakes I made and I always wanted to expand the ARC to include mining facilities, remote docks and outposts in the asteroid belts of the Verse. Of course, the Kuiper belt around White Sun is simply too large for the format of the ARC as it is now, but I took the liberty of adding two far flung dwarf planets and their satellites. As for Motherlode (around Red Sun) and Uroborus (around Blue Sun), they now sport dozens of outposts and mining facilities. The names listed are nicknames or shortened version of much longer titles, such as CMC - N1, which stands for 'Corone Mining Consortium - New Facility 1'. My many thanks to the fans who contributed names for these lonely, remote rocks. 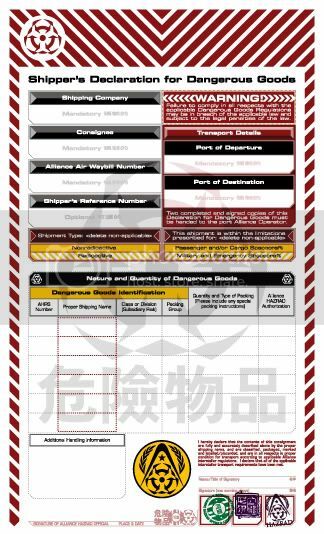 No set of ship's papers is complete without a Crew and Passenger Roster, so I had to make my own. I went with a very simple color scheme but an evil border. It was a nightmare to design and build. I borrowed a little from the border of an old mining certificate, but added and added and added until I went a bit blind. I'll go and rest my eyes now. The takeaway box is utterly adorable. 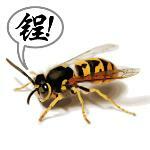 What is the wasp saying?? The yellowjacket is saying, "Shiny!." 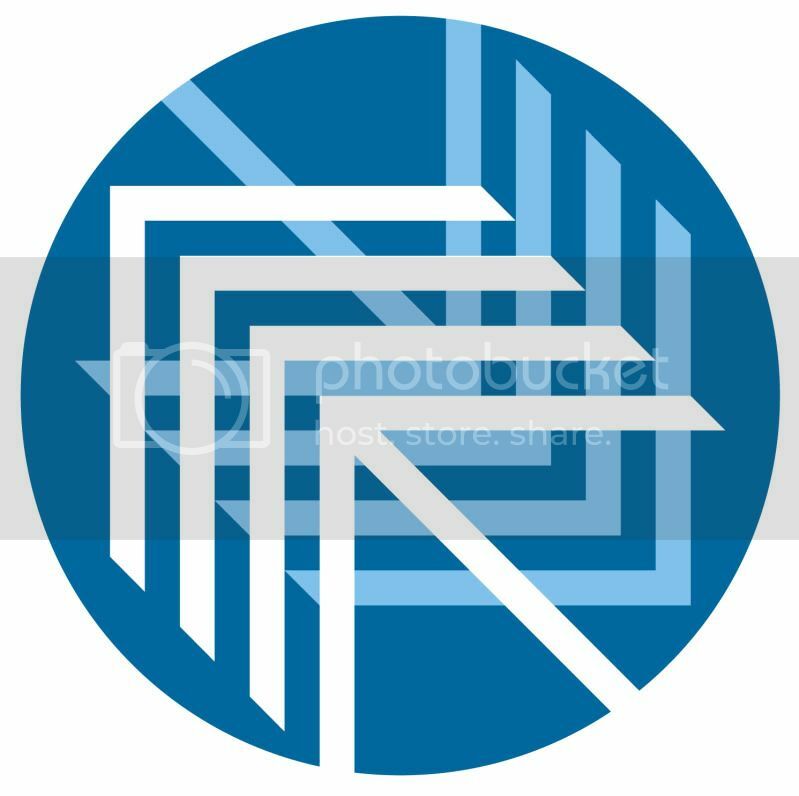 In addition to printed paper goods, I have to create a lot of logos, directional signs, labels and warning decals to be used as vinyls, stickers and paint decals. 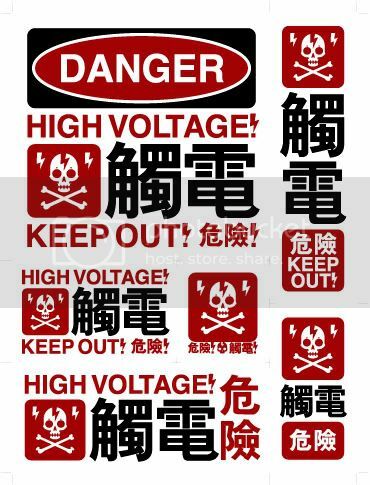 This is one of several electrical warning labels that I've been working on. I have three others in the process, but I love skulls, so this one was the first out of the gate. There are six different stickers to a sheet. They can be printed on sticky back paper or you can spray mount them to appropriate/inappropriate places. The crop marks are a bit tricky, but I was trying to utilize as much surface area as possible. I've done a collectible ticket each year that I've been involved with the Utah Browncoats' CSTS event. A few of this years' organizers asked me if I would make one available worldwide, so in keeping with my port authority ticket from last year, I've chosen another location significant to Firefly. New Burbank. For those not in the know, New Burbank is one of the cities directly connected with the manufacture of the Firefly Class Midbulk Transport. 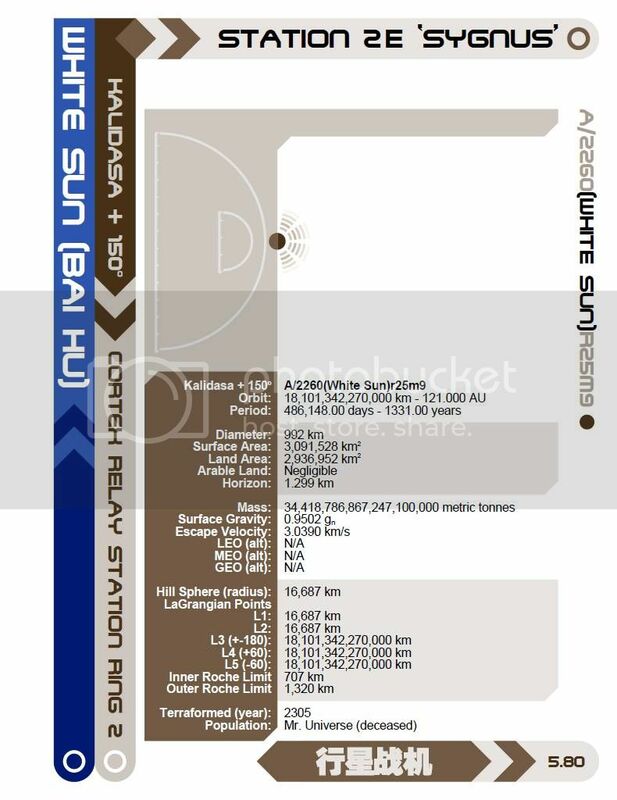 This is a passenger boarding pass for people traveling from Osiris. The document is a pdf and there are four tickets to a page. I recommend a plain white cardstock and then they can be cut down by hand or at the printer. I used the color scheme from Don McMillan's designs and borrowed some of his thematic elements to tie it to the theme, including his patch ideas as official stamps on the back. Print and enjoy. A year or more back I came across a fan drawn picture of Jayne reading comics, which is a personal favorite of mine, not just because it says a lot about Jayne, but it reminds us that comics are forever. I don't care how far out into the Verse we might get. Someone is going to draw comics. I've wanted to do some Verse comics ever since then, and with the advent of the Expanded Verse, it seemed like a good time. It also didn't hurt that I already had the TANG ad from another project and this gave me the opportunity to increase the history and scope of Tang. 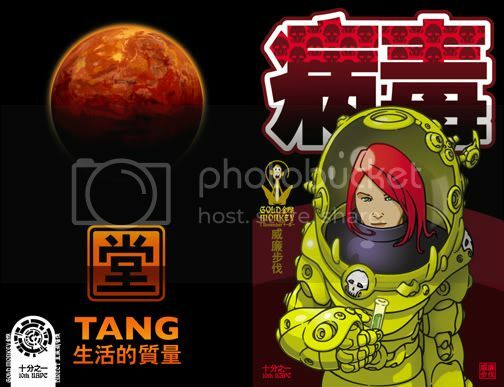 Tang is a super corporation that exports everything from tools to mules, and this comic shows just one more of the creature comforts they export to the Rim. Good old fashioned comics. I finished the layout just today. Then, while looking up some old contact information, I happened to notice that Namebrand used a similar tagging for his round barcode on a can of tomatoes from a few months back. Of course I was planning on the 'direct sales barcode' all along, but now I'm wondering if I didn't add it subconsciously from John's former project, and now that I'm thinking about it, this is my not so subtle way of asking John to show the tomatoes and every other cool thing he's made this year. Nudge-nudge. This particular comic is called Virus. Yes, I already have a second comic up and ready for printing. 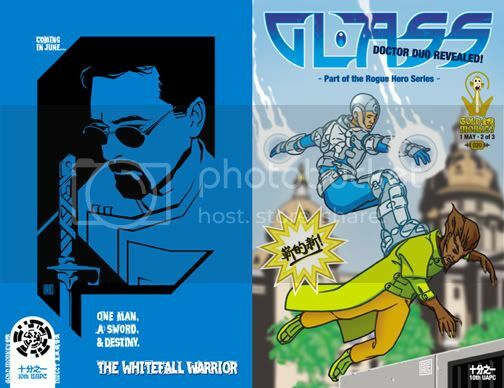 This is issue 20 of GLASS...a classic superhero comic complete with the back ad for an upcoming series called THE WHITEFALL WARRIOR! And yes, that is the Whitefall. Ben was kind enough to lend me his mug for the ad and an upcoming issue of THE WHITEFAAALLL WAARRRIIIOOORR! It has to be said with emphasis or not at all. Issue two of Virus! Well, the cover anyway. ...beagles. Nothing too fancy. Just paperwork. Thank you very much. I've been busy on other things, so it will be awhile yet before I update again, though I regularly add to this project over on fireflyprops.net. Yeah! I traveled over there a while ago when I was looking for inspiration for our wedding... I believe I saw some of your stuff there. It's been long surmised that the 'Fighting Elves' are probably a rugby team (given the name and the fact that Jayne would probably follow only full contact sports), so I decided to do a rugby ticket featuring the Elves and another team. Since the classic '28' is often used I chose another team player's number for this particular ticket (and because this particular number is mentioned throughout the series). I borrowed on classic rugby tickets for the various information. I also idealized the classic Fighting Elves logo by dropping out the white bits behind the lettering. This one doesn't have a backer, but I may add one later. Here's another from the same series. It's been awhile, which is not to say that I haven't been busy, what with captaining Can't Stop the Serenity and helping local events. I was privileged to be apart of the CSTS LA event when I created tickets, passports and a poster (alongside Sean Kennedy and Andrew Pace) for their shindig. This is the poster for the LA event. Of course it features the planet 'Angel'. My thanks to Sean Kennedy and my brother Andrew for the digital effects. Thank you, and you're welcome. Here is another. 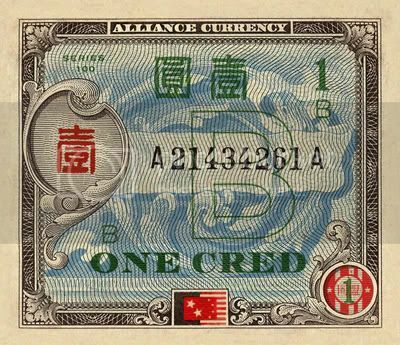 I found a delightful little 'One Yen' note from years back and modified it to look like a late war credit. 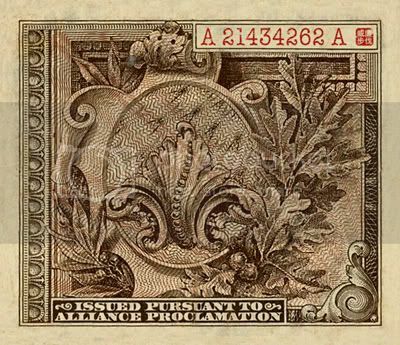 The backstory of this bill is that it originated out of the 'camps' (both military and prisoner), but it has been circulated widely enough, then and since, that it is still acknowledged as viable, legal tender in a few places on the Border and Rim. It is used most commonly in the Blue Sun system. I made the corresponding numbers different, so when printed, they'll appear to be different, though there are only just the six bills. 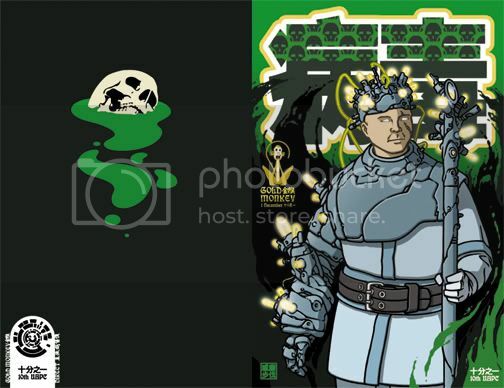 Would mind if we use some of your creations in our local Firefly LARPS? we run usually 2-3 a year here in Houston at local cons, I'm seeing whole plots spinning off of some of your documents. Yes, by all means. Use them where you will and enjoy them. This is another one inspired by the Spokane Browncoats, and as Spokane is called the 'Lilac City', what better place to put a little town than Lilac. I wasn't planning on making a travel poster for Lilac at all, but this one hit the ground running. Like all travel posters, it shows Lilac in an idealized light. Sans Reavers. The perspective is forced and surreal, as the spire is shot through a fish eye. Also, Lilac City is shown a little larger and more finished than it is in real life. 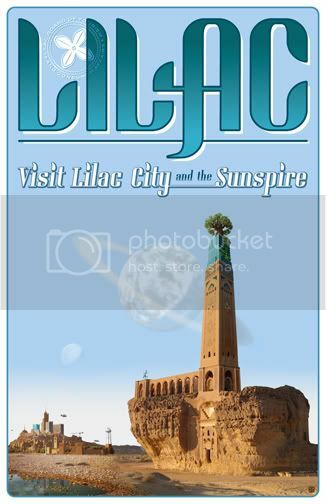 New Canaan is shown as a dynamic backdrop along with Ugarit. 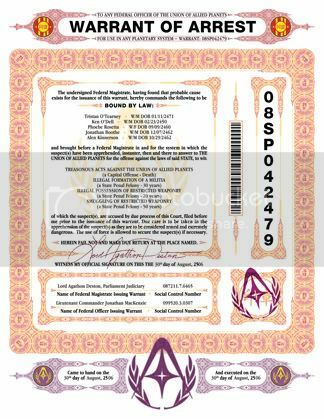 Alliance currency is generally accepted in all places, but some smaller facilities and remote locations choose to control their local economy through the distribution of 'trade vouchers', which are allowed by law if they meet certain criteria. For example, a mining facility which sees little or no outside traffic might control the rise and fall of the Alliance Credit and the local value of money and inflation through the distribution of their own mandated currency. Some corporations, slavers and the like will issue locally printed and backed credits as a control mechanism, and as 'trade vouchers' are allowed under the limitations of any micro-economy that fits within the regulations of trade and commerce as dictated by the UAP, some people take advantage of their employees and citizens by restricting the flow of outside currency. There are also groups, companies, etc. who may choose to issue local currency for the soul purpose of quiet defiance, such as Independents that haven't 'come in from the cold' since the end of the war. These Browncoat factions may choose their own currency as a protest, using the laws of trade and commerce to their own advantage. A sort of independent day to day in a highly allied Verse. 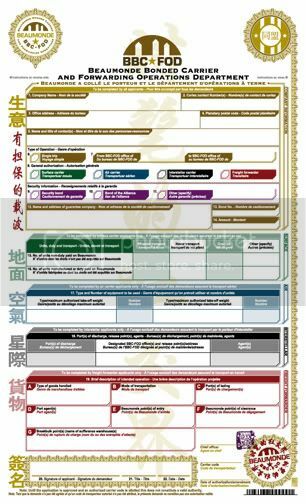 Trade vouchers are also used when there are enough world currencies being passed about in a single local economy that it creates confusion, such as a border world which might deal in goods and services backed by bills printed on dozens of different worlds. 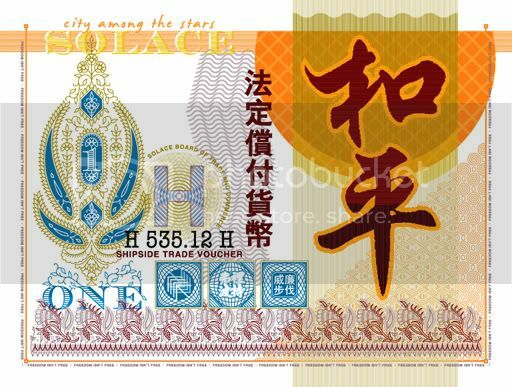 While all of these currencies might seem 'unified' in value, the use of a virtual credit versus 'cashy money' can be somewhat diversified from one local economy to another, paving the way for many an aspiring corporation, governor or subversive, underground potentate in a shiny hat to make money and maintain control. A hand in every pocket , as it were. For this reason, travelers are advised to check for the 'Trade Voucher' mark when making change. This mark can be the difference between valuable folding money on one world and very fancy toilet paper on another. Of course, some people choose to keep vouchers, as many travelers do, because money is just fun to collect. One of the more interesting bills to bear the voucher mark comes out of a roving, restless freeport called Solace. Made up of dozens of new and old ships, the ever growing Solace is a space station on the move and a city nation in it's own right. 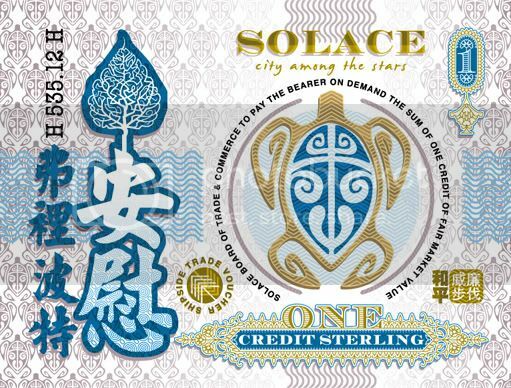 Inhabited primarily by veterans and loyalists of the Independent movement, the citizens of Solace choose to maintain a commerce free of the Alliance name, but well within the regulations of the loopholes of the same. They will gladly, and fairly exchange your credits for theirs, if only to keep Alliance currency out of sight and out of mind. After all, at the end of a long day no Independent worth his brown coat should have to pay for food, clothing and shelter with the Alliance's blood money. I've created these four up to a page, double sided and with 8 different numerical series to keep the numbers unique, and to add a little variety to your cash money collections. I have series E-H if Frank doesn't mind hosting 4 more pdfs. 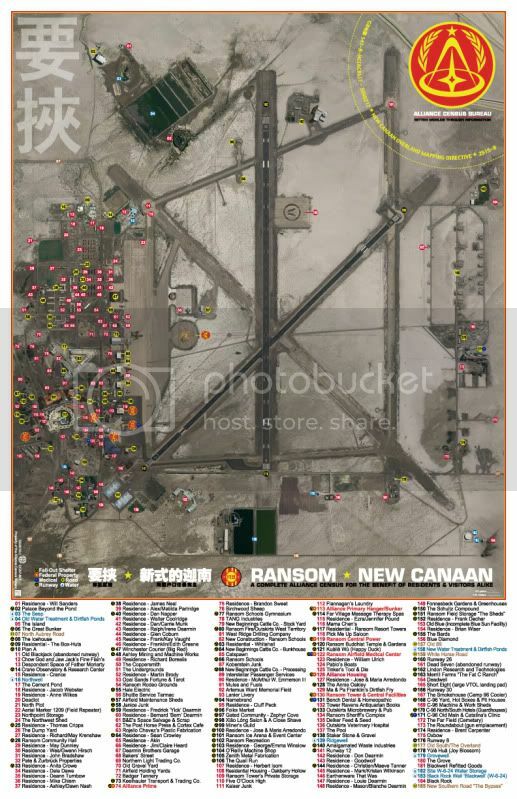 This is the culmination of a lot of hours piecing images together and creating background history (see here... http://fireflyprops.net/viewtopic.php?f=25&t=336 ), but I'm finally done with the first draft of the Ransom Project. Ransom is city on New Canaan, and a pet project since 2008. Here is the first one that I've worked on for STAND. 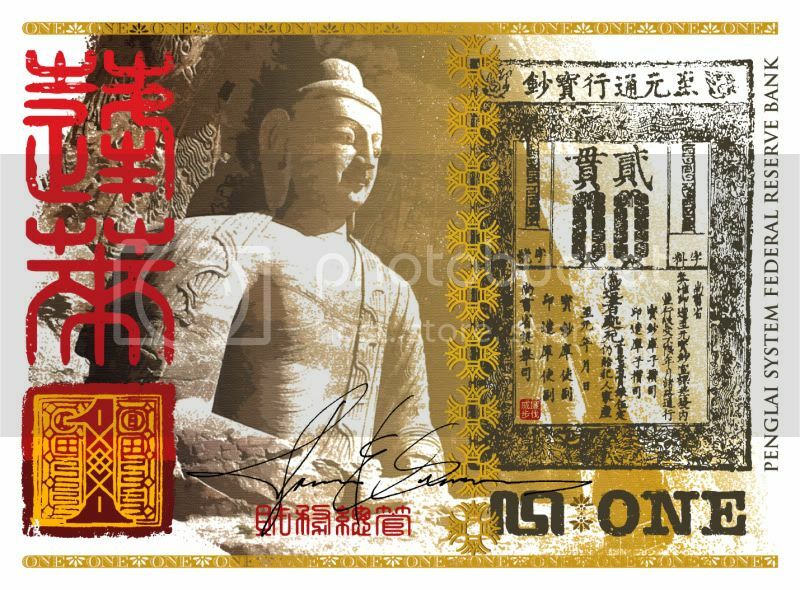 http://standmovie.blogspot.com It's a prewar issue One Credit Note that was financially backed by the Penglai System Federal Reserve Bank. 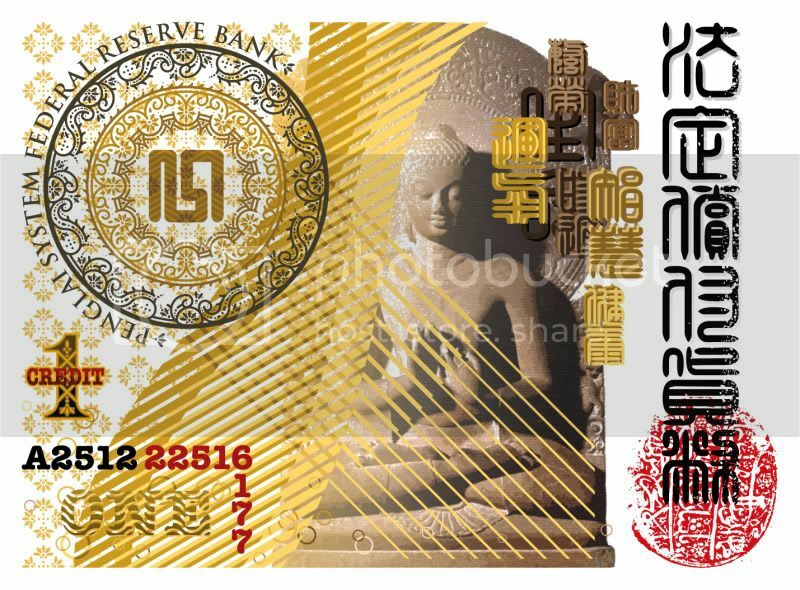 This credit was widely circulated in the Kalidasa System and is still legal tender in a few pockets of the same, but the bills are seen less and less all of the time. Wow, your work is incredible! Thanks for sharing it! That is stellar work and frankly I think you deserve a 'sticky' on this site for your endeavours. Apart from the fact that all the work is incredibly detailed, beautiful and BANG on theme, you have also a consistent style that compliments the whole. It's very impressive and if you're not already hired as a concept artist/designer.. Well you ought to be. I've worked with creative directors who haven't 1/16 the talent you have!!! I couldn't agree more! Surprised it isn't stickied! Thank you very much. I am not hired at the moment, so I'm devoting my time to charity and Firefly, but I appreciate the kind words. Thank you. I post often enough to the Expanding Verse that it's as good as stickied. I'm slowly returning to the long list of promised documents. 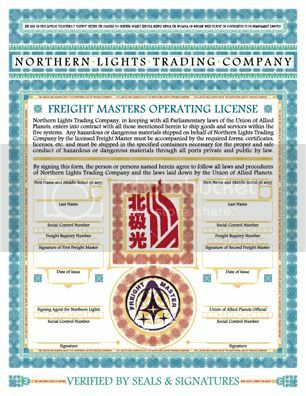 This first document is a Freight Masters license for freelance crews who want to carry product for the Northern Lights Trading Company. The license guarantees them certain rights and freedoms as a shipper without being a full time employee of NLTC. And...it gave me a great excuse to do a whole mess of Celtic border designs. To make this particular document, I first had to design a very corporate, stylized logo for 'Northern Lights'. You're welcome. I'm always pleasantly surprised to see my work show up in photos at Can't Stop the Serenity Screenings, conventions, LARPS, and every other kind of Browncoat shindig around the world. I'm a huge fan of charts, gaming and Firefly, so when J. Chris Bourdier asked me to partner up with him in the release of a new 'Verse in Numbers' (The White Paper), I jumped all over it. We've already updated it several times and it never occurred to me to share it here until now. It's a huge file in terms of pages, but if you like Firefly, writing and gaming, I think you'll like this. 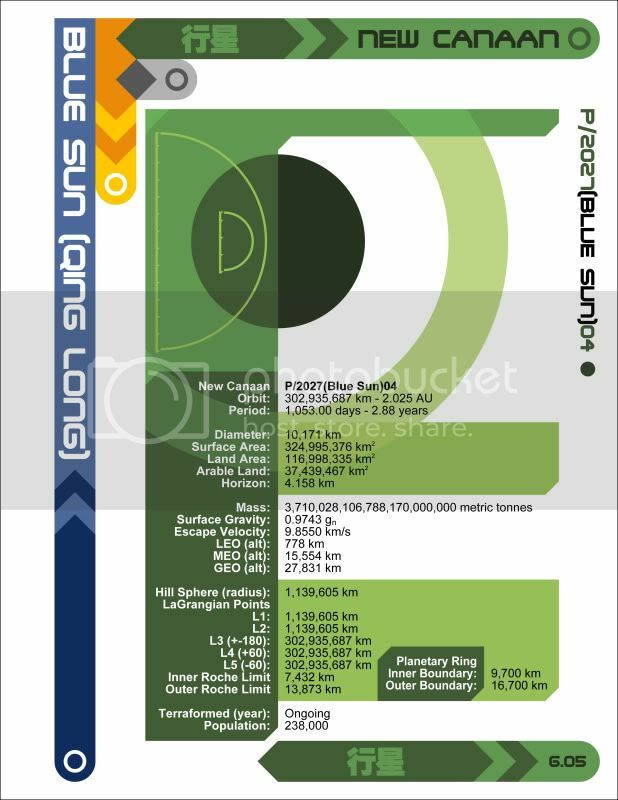 This is a slimmed down, easy reference version based on the same materials called the Astrological Reference Charts (ARC) of the Verse. 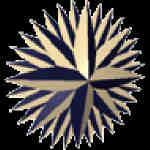 Mr Universe's Moon has a new name, Sygnus, on page 5.80 (Chapter 5, page 80) of the July Version 2.01. Happy Anniversary Firefly! In honor of all things 'Bag Guys', I offer an arrest warrant that was privately commissioned awhile back. If anyone would like a custom version for their prop collection, please get me names and dates and I'll add you to the 'list' as my schedule permits. Long Live Firefly! 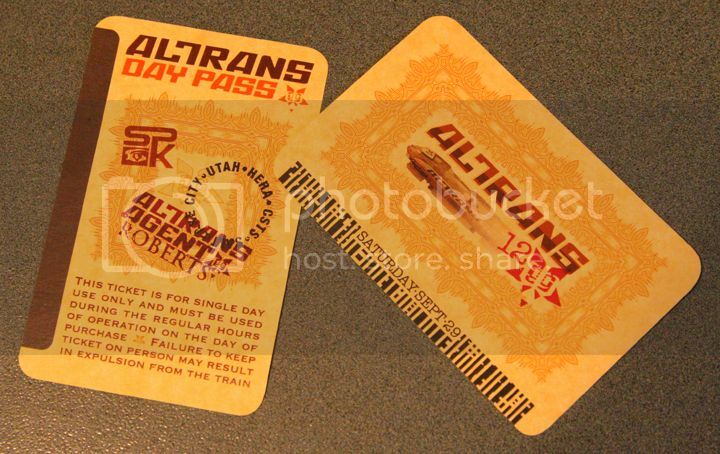 In addition to the tickets I collaborated on for Phoenix and Tucson, I also worked with Sean Kennedy on an 'Altrans Day Pass' for the 2012 CSTS Salt Lake City event. This ticket was styled after those paper bus and train passes with the magnetic strip that are used in metropolitan cities the world over. It's for the Altrans line serving Utah on Hera. As Christopher Roberts was the CSTS organizer for that event, his name appears as the Altrans Agent. The pdf has the tickets 8 up to a page and the corners are meant to be rounded. I printed the tickets on a parchment cardstock to give them the proper ticket weight. Click the link and do a 'save page as' to copy it to your computer if it does not automatically download. The VIN keeps growing and more pages are added all of the time. As it grows in size, the chances of it being altered for print decrease. A print friendly version would add days, maybe weeks to each revision. 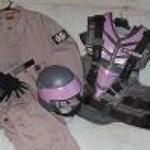 Here's a sneak peak at some props I created for the 'Browncoats: Independence War' project, which is in post production. Ohmigod! Holy Mother and all her wacky nephews indeedie! I'm only half way through this thread, but I've got to surface for air and scream to the skies -- your designs here fabulous! Absolutely fabulous! Exactly the sort of 'Verse-building crunchy bits which I crave for! More please! More! Thank you, Captain! There's always more. I'm connected to several fan film projects in post production and a few slated to start within the year. I also make lots of custom props for Can't Stop the Serenity events worldwide, so you're bound to trip over something I'm working on somewhere. Wow, brilliant creations. When in the nine hells do you sleep? 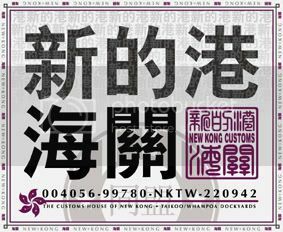 Seriously love your work, my favourites so far are the takeaway box (awesomely shiny) and the creds and other currency notes. Gorramit, keep doing what you do! 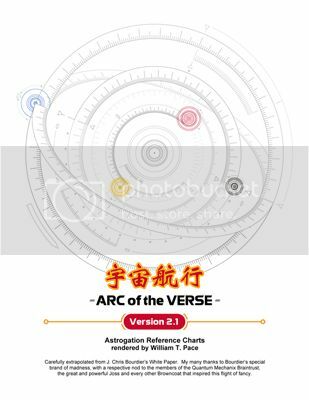 After a long hiatus, due to too many issues to count and one delightful hard disc recovery, we have the new versions of the Verse in Numbers and ARC of the Verse. Enjoy! Do you have a list of which items have been revised, added, edited? Nice work enjoy this thread.